Having decided to pursue home-baked bread in earnest, we picked up a copy of Jeff Hertzberg and Zoe Francois' Artisan Bread in Five Minutes a Day. The title is alarmingly infomercial-like, but the content is decidedly unso. It is also a little vague -- it should be "Artisan Bread in an Average of Five Minutes a Day," since the dough-mixing day involves half an hour of measuring out cups of flour and then the other involve sliding the dough into the oven -- but our schedules conform to this regimen easily enough. 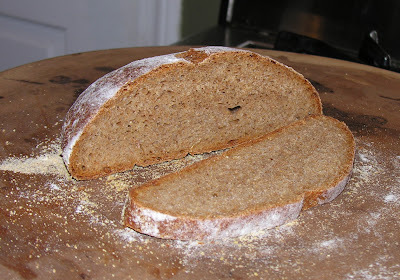 In an attempt to placate Mia, I picked the 100% whole wheat sandwich bread for the first experiment. 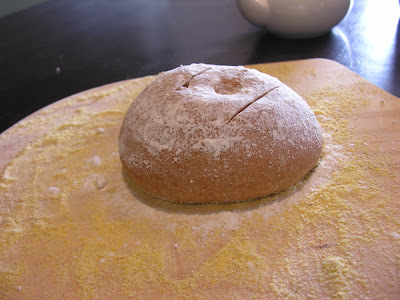 In retrospect, the simple master recipe boule would have been the right choice, since in general the best way to develop any skill seems to be to start with its most basic application. 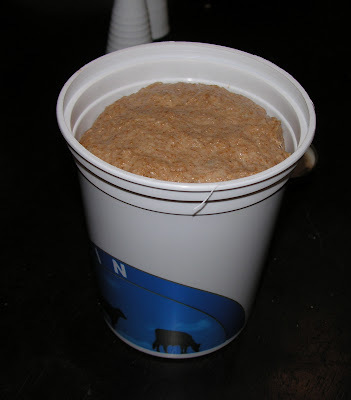 But we like our germs and brans, so I reached for the bag of whole wheat flour and added it to the yeast, honey, olive oil, and milk waiting in the food processor. The authors suggest making a large amount of dough and then storing the residual in the refrigerator so that fresh bread can be available throughout the week without mixing more dough. Expecting to learn quickly by doing, I made half a recipe, enough for two small breads; luckily, this also happened to be the maximum amount of dough that fit in the food processor, so I didn't have to mix the dough by hand. After mixing the few ingredients together and letting the dough rise for 3 hours in a covered bowl, we transferred the sticky blob to two cleaned-out quart-size yogurt containers and put them in the fridge. The dough expanded to fill the container, but there were no explosions or eruptions. Then we slid it off the peel and onto the warm baking stone. 55 minutes later, we had our first finished product. Though I may have declared it an "unqualified success," our first bread's success wasn't without its qualifications. It tasted good and looked and felt like real bread. But the texture and moisture of the interior, and the crust, while not problematic, could stand improvement. We will continue to update you as our experiments unfold.